Just started to do surf? Or are you looking for an activity to get out of the routine and disconnect. Perfect, you´ve made the right choice. Surf is a great sport for this. One of the first things that we have to do to start on the right foot is choose our companion for our adventures. This is none other than our surfboard. For this reason we´ll give you a few reasons to look out for cheap surfboards. A lot of times, due to our eagerness to start to surf and do it economically, a lot of people that start to surf end up choosing cheap models. Ignoring some important details. Today we´ll give you 4 reason why not to buy a cheap surfboard. Why is it so important to choose the right surfboard? The election of your surfboard is the most important aspect of this sport. Getting it right from the start will help you start to catch waves faster, and not to lose motivation while trying. Just as with other sports, when you start to surf we are hyper motivated to use all our energy and free time to practice this sport. The emotion and adrenaline are two sensations that we can lose if we don´t feel motivated, or we feel we aren´t improving with time. To minimize this risk of falling of the path, choosing the right equipment is especially important. In the case of surf, it´s important to pay special attention to a few factors before getting your first board. How to choose my first surfboard? 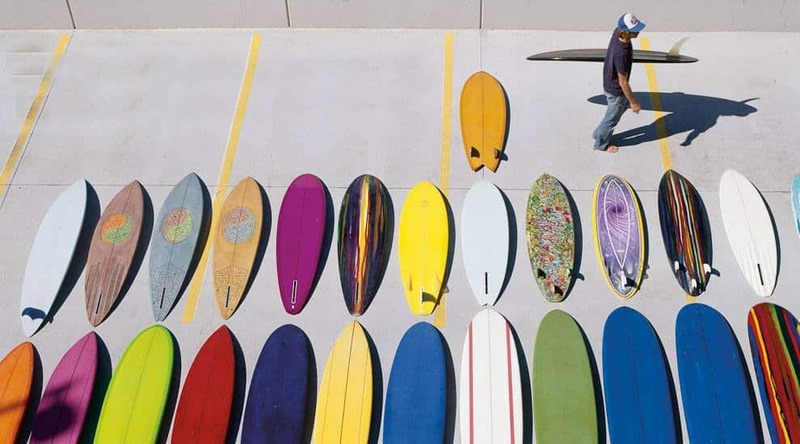 The volume of a surfboard is just the quantity of area in the board and it´s calculated based on its longitude, the width and thickness of each model. It´s measured in liters. The more volume you have, the more stability. And why is that? More volume, the more it floats. Factor that will help you catch more waves when initiating. It helps that our friends in Single Quiver have a “surfboard recommender” developed in their website. The election of the volume is essential, since it will influence positively or negatively in our surfing. If we choose correctly it will help us to paddle, give us more stability and more or less capacity when doing turns. For people that are initiating or generally, the bigger the board, the better. The length of the surfboard is measured in feet and inches. The ideal size for people starting is a board that is at least 7´2” (2.2 meters). Like for example the NSP 7´2” White Elements or The Beastie 7´0” from Mick Fanning Softboards. Both good for starting surf. It´s true that this type of surfboards are heavier and harder to transport. But unless you have a natural born talent for this sport, at first you are going to be paddling a lot. So it´s best to choose a big board for this end. Some of you will ask; why would so many people surf with a shortboard? The answer is simple, shortboard are cheaper. 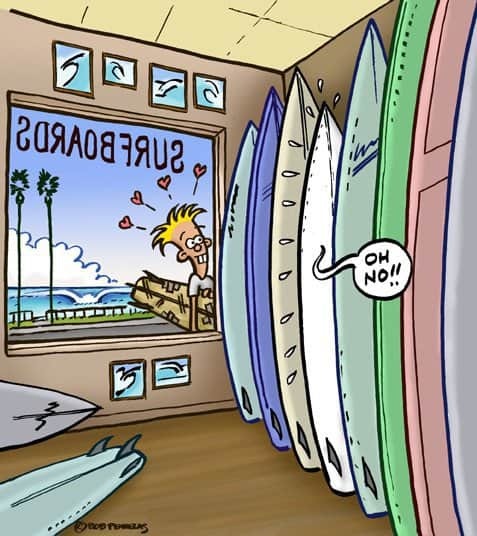 That’s precisely why you shouldn´t choose your first surfboard based on price. 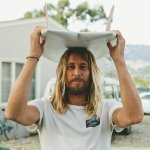 Which are the best models for people that are initiating surf? There are 3 types of boards that are specially made for people learning to surf. Softobards, Mini Malibus and Funboards. Softboards are made with a spongy material called foam. They have an important characteristic compared to the rest of boards in the market: they offer great stability, they are ideal for catching small waves and its material avoids strong blows to other surfers (and you). If you want to know more about these types of boards we recommend you check out this video or read our post on the advantages of softboards. If you´re not just trying to see if surf is your sport, and what you´re looking for is a board that will give you continuity, we encourage you to try out a Mini Malibu. They are rigid, and also let you paddle well and have good stability. Just as with Funboards they are models that help and shorten learning time. Perfect for surfers that just came out from a course and want to practice autonomously. Apart from buying a new surfboard, there is the option to buy a second-hand board. Boards that have economical prices. Recently we gave you tips on how to choose your second-hand surfboard. With a few guidelines and checking some things you should be able to get a used board. If you don’t want to miss any of our tips and tricks from #EnelPico subscribe to our Newsletter and you´ll have access to exclusive content.